When I first approached Dr. Just on his potential interest in the emergence of social media in healthcare in general and medicine in particular, we engaged in conversations that generally tethered to a contribution to a ‘legacy’ theme. Reflecting on a now 40 year career in community based medical oncology he was thinking about winding down his participation in a full time practice while passing on the deep wisdom and insights developed over the decades. Considering the explosion of digital media platforms and capabilities, and the low hurdle rate to participate via this medium this consideration was rather timely. The first order of business was to brand that voice and craft a social media ‘presence’. As I reflected on his last name ‘Just’, and saw a double entendre opportunity to conflate ‘just’ with ‘oncology’ – I thought how perfect! Lets brand you as ‘JustOncology.com’. Since in this context ‘just‘ could mean ‘Dr Just’, or solely focused on oncology, or even just in the sense of ‘equity’ or fairness in oncology care. In all cases, the branding expression and focus was clean and consistent with his interest to write, speak and counsel others on the journey. So we created the blog JustOncology and twitter handle @JustOncology (though he principally tweets via @chemosabe1) and shortly thereafter launched the radio show ‘this week in oncology’. As noted in the masthead above Dr. Just writings would reflect on ‘health, illness & evidence based medicine’. An intentionally broad brush tapestry that included everything from his personal health encounter with heart surgery, the move into value based pricing for oncology services, oncology ACOs, seemingly interminable encounters with EHRs that actually work for the practice, practice mergers, partner relations and the most recent shift into ‘integrative oncology’ which has literally taken him offline for almost a year – at least as a principal contributor to this blog. So as his partner, de-facto editor and co-contributor, let this post call attention to two projects that fit squarely into the ‘legacy’ theme and Dr. Just’s valuation of and advocacy for truly ‘patient centered care’. 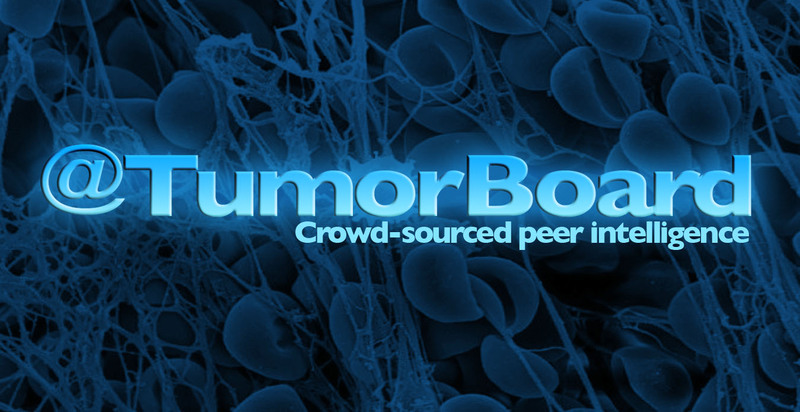 Meet @TumorBoard aka TumorBoard (dot) com and CancerCenter (dot) TV – both projects in the incubator of ideas in search of funding support. A little history on @TumorBoard includes the following introduction from our concept paper. A treatment planning approach in which a number of doctors who are experts in different specialties (disciplines) review and discuss the medical condition and treatment options of a patient. In cancer treatment, a tumor board review may include that of a medical oncologist (who provides cancer treatment with drugs), a surgical oncologist (who provides cancer treatment with surgery), and a radiation oncologist (who provides cancer treatment with radiation). Also called multidisciplinary opinion. Once a popular collegial if not ‘social’ venue to network and learn from one’s peers, periodically present or consult on cases, possibly earn CME credit, if not grab an occasional meal, tumor board has unfortunately lost some of its attraction and ‘gravitas’. Increased practice complexity, misaligned financial incentives, declining reimbursement and growing demands on physician time, are some of the obstacles resulting in declining physician participation in traditional hospital based tumor boards. Yet few other comparable multidisciplinary, peer based clinical forums outside of mature integrated delivery systems or academic medical centers have the potential to enable the integrated practice of collaborative, coordinated and evidence based community cancer care. most of these [tumor board] conferences…are based on a “show and tell” mentality rather than serving as treatment-planning conferences utilizing the expertise of the participating multidisciplinary experts…. In other words, traditional hospital based tumor boards have not yet fulfilled the promise of better care or improved outcomes as a result of the assumed value add of multidisciplinary engagement in cancer diagnosis and treatment. Apparently, business as usual ‘silo-ed’ medicine remains embedded in the care process even in the midst of what appears to be multidisciplinary consideration. The high cost of cancer treatment and parallel shift of a greater share of the total cost burden on to a resource constrained and often health literacy challenged patient. A heightened awareness of the need for increased clinical integration and care coordination across an otherwise silo-ed and discontinuous portfolio of specialties. Formal recognition that the upside of the multi-disciplinary engagement of cancer specialists (i.e., tumor board), has neither realized nor fulfilled its collaborative promise (see: Tumor Boards (Team Huddles) Aren’t Enough to Reach the Goal). Emergence of an informed and engaged ‘e-patient’ (witness the launch of SmartPatients). A nascent yet growing pool of technology savvy, patient-centric cancer specialists who value peer based collaborative multidisciplinary care with active engagement of the patients under their care (See e-patients and the Society for Participatory Medicine). For more information, download the TumorBoard concept paper via tumorboard_description_v1.5. It’s been a while since Dr. Just has been able to put pen to pad and update you on his journey (and their is lots to tell from group mergers to a continuing drama with EHR implementation) into social media and a ‘transition’ to full to part time practice in a multi-site community oncology practice. More soon from Dr. J aka @chemosabe1 – at least I’ve been told. Meanwhile, below is a clip producer by Jay Walker the curator of TEDMED and noted Professor of Medicine and Engineering at the University of Southern California Keck School of Medicine and Viterbi School of Engineering oncologist David B, Agus, MD well worth a view! Also, we had a great session today on ‘this week in oncology’ chatting with Stephen Wilkins the publisher of ‘Mind The Gap’ blog. You can listen here. Big Data, Government and Cancer Research: A Benefit for Patients? On the Wednesday, July 24th, 2013 broadcast of This Week in Oncology at 2PM Pacific/5PM Eastern our special guest is entrepreneur, social media thought leader and Forbes Contributor Dan Munro aka @danmunro. This catchy headline caught my attention since part of our mission at This Week In Oncology is to eliminate the esoterica from ‘oncology-speak’ and to present the significance of the discoveries, trends and developments in the cancer care and dignostics in plain english for more general consumption. Much progress has been realized in medica oncology of late with a fair amount of the promisesd upside of ‘personalized [or individualized] medicine’ often pointing to better outcomes via more targeted treatment of specific tumors based on their unique genetic signature. So called ‘big data’ is in the news as ubiquitous technology, connectivity, the declining costs of massive data dragnets and disease specific mashups affords insights previously inaccessible to reseachers, clinicians and others interested in the diagnosis and/or treatment of oncology. We’ll get Dan’s takes on his piece and see how he sees the confluence of these trends coming together for the benefits of patients. To listen live or via archived replay, click here. In a discussion moderated by Dr. Peter Salgo, Drs. Jeffrey Weber, Michael Kolodziej, and Daniel J. George share their insights and perspectives on the rise of cancer immunotherapy, and its significance during a time in which cancer is recognized as the “new global pandemic” that has killed more than 600,000 US persons in 2012 alone. For original source link, click here. Last month in a continuing commitment to advance the art and science of patient engagement in health the Office of the National Coordinator for Health Information Technology (ONC) teamed up with the National Cancer Institute (NCI) partnering with Health 2.0 Challenge and the Medstartr crowd funding platforms to field an innovative challenge on creating applications for the estimated 14 million cancer survivors in the United States. For complete program details on the the ‘Crowds Care for Cancer: Supporting Survivors‘ challenge click here, and for the finalists now in the crowd funding optimization stage see the Medstartr finalists feature page here. On This Week in Oncology, we chat with each of the three finalists in the competition, beginning with Journey Forward: My Care Plan, a project by Tiffany Devitt. On Thursday, June 27th, 2013 at 1:30PM Pacific/4:30PM Eastern to join us live (or for an archived replay) with Patti Ganz, MD of the Journey Forward: My Care Plan team, click here. 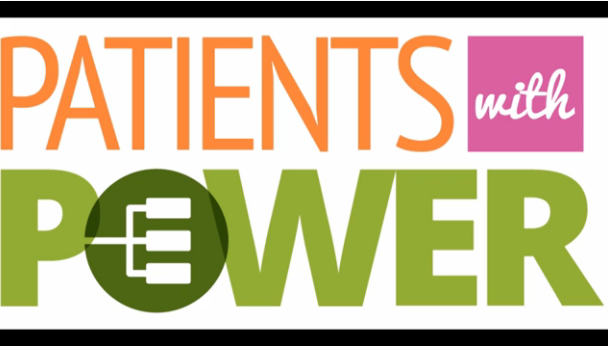 PatientWithPower: A project by PatientsWithPower | 11AM Pacific/2PM Eastern Friday, June 28th, 2013. For live or archived replay, click here. Together: A project by Michelle Longmire | 11AM Pacific/2PM Eastern Tuesday, July 2nd 2013. For live or archived replay, click here. Please review each of the candidates in this important challenge and show your support accordingly. The leader board to date is as follows: PatientsWithPower, Journey Forward: My Care Plan followed by Together. Tumor Board: Is There Value in Multidisciplinary Case Consideration? Via these standards there were both structural and certain process considerations to meet, but the underlying assumption or zeitgeist of the value proposition – better cancer care – was that ‘multidisciplinary’ engagement of cancer specialists in the diagnosis and treatment of cancer patients would produce superior outcomes. Then in October of 2012 Keating et al published a study titled: ‘Tumor Boards and the Quality of Cancer Care’. While somewhat dated (interval 2001-2004), and not generally representative of community oncology practices per se (the sample was sourced in the Veteran’s Health System), the conclusions are none-the-less a compelling call to objectively demonstrate long held assumptions of the benefits of tumor board ‘collaboration’. Despite the widespread use of tumor boards, few data on their effects on cancer care exist. We assessed whether the presence of a tumor board, either general or cancer specific, was associated with recommended cancer care, outcomes, or use in the Veterans Affairs (VA) health system. We observed little association of multidisciplinary tumor boards with measures of use, quality, or survival. This may reflect no effect or an effect that varies by structural and functional components and participants’ expertise. ‘Tumor Boards May Not Really Impact Cancer Care‘, and ‘Little association of multidisciplinary tumor boards with effects on cancer care‘, but the title that grabbed our attention was an opinion piece in response to the Keating study offered by Douglas W. Blayney, MD, Stanford Cancer Institute, Stanford School of Medicine, titled: ‘Tumor Boards (team Huddles) Aren’t Enough to Reach the Goal‘. abandoned. Much like the “hurry-up” offense changed the conduct of huddles in football, tumor boards should also adapt to the changing times and technology. In the system studied by Keating et al. (1), there are only huddles and no feedback loop. Their measurement work provides a reason to change tumor board conduct. On ‘This Week in Oncology‘, May 22nd, 2013 at 2PM Pacific/5PM Eastern Dr. Blayney is our very special guest. We’ll dive deeper into his thought process, rationale and recommendations to tweak the tumor board formula via technology and other process adds, to perhaps better align this important multi-disciplinary experience with improved patient outcomes. From which he none-the-less associates inspiration for his scientific inquiry. Suffice it to say, Jack was neither encouraged nor challenged by the curriculum, and found other ways to engage his mind and curiousity. 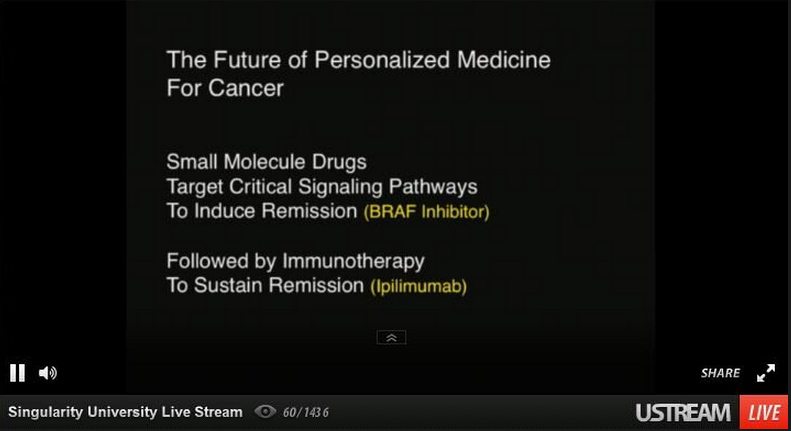 My dream is to get rid of chemotherapy and do it with the immune system..
Last week FutureMed at Singularity University on the campus of NASA Ames in Mountain View, California ran it’s week long intensive for 2013. This year It’s executive director and principal organizer, Daniel Kraft, MD gave the cyberspace crowd a full day’s taste of the program on Tuesday, February, 5th. For the agenda including links to faculty, click here. We are thrilled that Jack will be joining us on ‘This Week In Oncology‘ on February 20, 2013 to learn more about this remarkable young man and discuss his journey into science and making a difference. We’ll post the details and program description shortly. Biometric Monitoring Systems: A Role for Monitoring & Managing Cancer? CES 2013: The Year of The Quantified Self? So in this entrepreneurial frenzy and resultant sea of digital health apps all chasing the holy grail to define and manifest a healthier America, much attention has rightfully focused on the capture, reporting and sharing of meaningful biometric data to maintain health, improve health literacy, better inform doctor/patient communications and ultimately support improved health outcomes. Imagine if you could have a conversation with your body on a cellular level. What if you asked your cells, how am I really doing? Am I healthy? Is my treatment working? Is there anything I could be doing better? Sound interesting, if not a bit of an over the top claim to make? it did to me. So on the Wednesday, January 30th 2013 broadcast of ‘This Week in Oncology‘ we’ll chat with the inventor Michaeal Singer and dive deeper into the peer reviewed science supporting the ‘well established technology’ cited above. To state the obvious, at least from the point of view of cancer patients wondering what is happening at the cellular level minimally in between those routine or non-routine follow-up visits to the oncologist, if this metric can reliability report on the underlying state of health or to the contrary tumor pathogenesis, this is the kind of ‘biomarker’ information most cancer patients would want to have. My life was essentially on autopilot. My oncology practice was very successful; in fact, too successful. All my time and energy was devoted to keeping pace with the increasing demands of the profession. Other pursuits, be they personal or professional, always seemed to take a back seat. My main unfulfilled passion was writing. On January 7, 2011, everything changed. I had a new bovine aortic valve and three new coronary artery grafts. A life altering event, to say the least. Fortunately my recovery has been uneventful, and I had no evidence of muscle injury. So I’m extremely grateful for the pre-emptive surgery, and since I’m back to work on a part time basis, I now can devote some of my attention to writing. For the past several years, a colleague, trusted advisor and friend of mine, Gregg Masters, had been prodding me to “just do it”, i.e., just start blogging, podcasting and life streaming my experiences in Medicine. He pointed out the value of my 36 years in clinical practice of hematology and medical oncology as 'elder wisdom' currency in relative short supply. In truth, there is certainly a lot to write about as the clinical knowledge base has grown enormously, to the point where management of all this information requires computers. Fortunately, technology has developed at a rapid rate also so that we can not only mine all this data to obtain meaningful information, but better disseminate it to each other, health plans (including government) and especially our patients. With the advent of social media including Twitter, Facebook and You Tube, this flow of information becomes a two way street allowing physicians to listen as well as talk. On a personal note, my wife published daily status updates during my surgery and through the post-operative period on a website called Caringbridge. She posted pictures as well as narrative. Colleagues, relatives, friends and patients had a window opened to them as to how I was doing, and they in turn wrote back notes of encouragement that touched me deeply. When Gregg and I thought about it, his background not only in 'web 2.0' (social media) but perhaps more significantly his considerable experience in the business aspects of medicine brings value into the conversation as well. In today’s environment, physicians are constantly reminded that we not only are responsible for all aspects of caring for patients, but we are running a business as well. Years ago, I remember reading an excellent book called “The E-Myth Physician” by Michael Gerber. One of the chapters was devoted to the subject of “Money”. So Gregg’s knowledge complements my clinical background resulting in the birth of JustOncology.com. Certainly there is no shortage of topics to discuss. Utilizing a variety of media: blogging (which addresses my passion for writing), audio and visual interviews with as many of the stakeholders in cancer care as possible, we hope to provide a forum for discussion of problems facing us. From these interactions, the desired outcome is to identify solutions that can only come from a collaborative effort. JustOncology.com is a joint publication of Richard Just, MD, aka @chemosabe1 on Twitter and Gregg Masters, MPH, aka @2healthguru on Twitter.